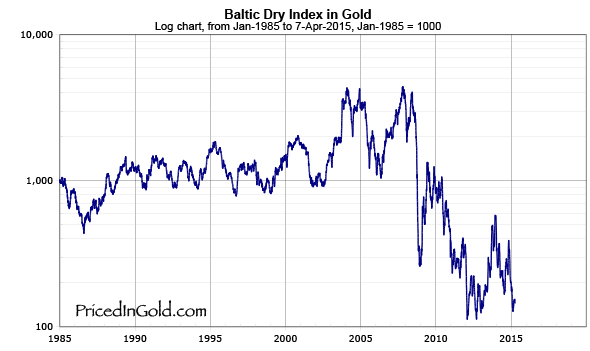 "The Baltic Dry Index (BDI) is an economic indicator issued daily by the London-based Baltic Exchange. Not restricted to Baltic Sea countries, the index provides an assessment of the price of moving the major raw materials by sea." We can see the low level of the BDI if we price it in gold (as if it was a currency). This is not showing any recovery, but the opposite. Probably we are sailing adrift and nobody seems to care. The incompetency of our politicians has reach a peak pushed by us, the uneducated voters.